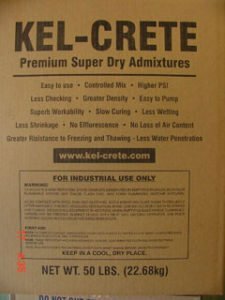 Kel-Crete Premium Super Dry is a NON-TOXIC admixture that is blended to provide WATER REDUCING, PLASTICIZING, AIR ENTRAINING AND GELLING functions for the manufacture of pre-blended products for the plaster, masonry, shotcrete, concrete, etcetera industries. Normally the recommended amount to use is ONE OUNCE by weight per 100 pounds of portland cement/fly ash(?) products. It meets EPA LEEDS and CARBON FOOTPRINTING standards. The product is packaged in 50-pound boxes.